Between 22 June and 6 July I took part in a marine mammal survey for ORCA on the Saga Pearl II as she cruised North as far as Svalbard. The drawings below were made whilst on half hour breaks in surveying and brief moments ashore in an attempt to capture a sense of the breathtaking landscape and abundant diversity of wildlife during my first encounter with the Arctic. The North Sea tested our endurance as surveyors, we were faced with rough seas and an ever strengthening wind chill as we headed further north towards horizons studded with the contorted steel frames of oil rigs. A brief stop in Stavanger offered a glimpse into the affect of this industry on a booming Norwegian economy. Layers of old and new; the old town with it's fish canning factory and wooden houses sandwiched between a skyline of modern blocks of flats and a sea front dominated by the mammoth hulk of oil ships. It's another day out of Stavanger and our forth day into the survey before the first shout of 'sighting!' ends the long wait since leaving Dover. Two fin whale roll in front of the port bow, the hanging blows whipped away in the north wind as fast as they exhale and they are gone. It is 04.40 June 26 and at 67 degrees North we had crossed into the Arctic circle. Here the Gannets that accompanied us further South have been replaced by fulmar and kittiwake gliding effortlessly on the ships updraft. The direct and purposeful flight of foraging auks such as puffin and Brunnich's guillemot contrast the fulmars euphoric movement dissecting our passage in ever strengthening numbers as we approach land. Soon after we arrive at our second port of call Leknes in the Lofoton Islands. That evening we skirted the stretched Archipelago and in the calm southern lee of the land picked up further sightings of harbour porpoise and minke whale, their subtle presence on the surface given away by the disturbance of a bait ball. The evening ended with our first sighting of Orca, a sign of things to come. We surveyed all the day of the 27th on deck as we crossed the open Sea that separates Svalbard from Norway. Sightings ranged from early in the morning with an amazing three separate counts of large pods of orca within a couple of hours, the tall black upright dorsal of the big bull males unmistakable on the horizon. Although all these views were distant, around 2km away and viewed in the binoculars, the ferocity of these animals could be recognised in the way their sail like dorsal fins quivered and reverberated with a force that belied the power of their thrashing movements under the waves. By midday sightings of orca, minke and white beaked dolphin had been replaced by the visible blows of the largest whales. A quick look at our position confirmed it, we had crossed over the land shelf and into the deep water where the ultimate megafauna thrives. Fin whale sightings were in abundance now, but also present were the rarer seen sei whale, which due to the confusing similarity between both species in the field presented one of many id challenges for me. I was however fortunate to have several sightings of sei whale, some even in close association with fin whale and was able to discuss each with fellow surveyors, Paul Burley, Kathleen Neri and Rachael Barber. I learnt first hand to distinguish the shallow surfacing sequence of the sei compared to the prolonged roll of the fin and the diagnostic but subtle difference between the dorsal of each species. Soon we catch sight of distinct angled blows and closer encounters confirm sperm whale logging on the surface and occasionally with luck we catch the dramatic display of a fluking tale as these true giants of the deep point into a dive heading one, two thousand or more metres down. Perhaps the most memorable sighting for me that day was another personal first; the cue was as normal a blow near the horizon caught in a scan of the binoculars then more unusually a big splash which at over a kilometre away had to be caused by something big. Then confirmation, a tall white flipper rising straight above the duller white caps before crashing down heavily on the water, again and again, unmistakable, a humpback whale! Okay, it may only of been a dot on the horizon but it was an ambition realised and I could even make out the characteristic fin slapping and breaching behaviour. On the morning of the 28th the view from deck is of calm waters reflecting monochrome contrasts of dark rock and white glaciers surrounding Isfjorden, Svalbard. The mirror smoothness is broken only by the occasional scuffing of a wind pocket, a cluster of little auk rafts and the slap slap of paddling wings as brunich's guillemot scuttle away from the ship's wake. That is until the slick dark shape of a whale arches silently out of the water, the body silhouetted black but glinting a brown almost gold where it catches the light. There is no distinguishing blow but a swept back dorsal suggests a fin whale. We pass two more fin whale in the fjord, all swimming shallowly it seems with few visible blows. On land we hike up the Longyearbyen valley to the edge of a glacier where we find fossilised plant material in the rocks scattered amongst the moraine under foot and hear the wonderful call of little auk on the colony ledges high overhead. On the outskirts of the town but within the permitted safety of its perimeter (beyond is polar bear country), boggy tundra holds a wealth of bird life; eider duck nesting in the safe shadow of the husky kennels, brackish pools on the side of the road attract purple sandpiper and the grey phalarope which is in fact a deep rusty red here in its breeding plumage. There are barnacle geese on the estuary and the mountainsides whilst Arctic-turn defiantly guarding their nests are a constant hazard even in the most built up areas. 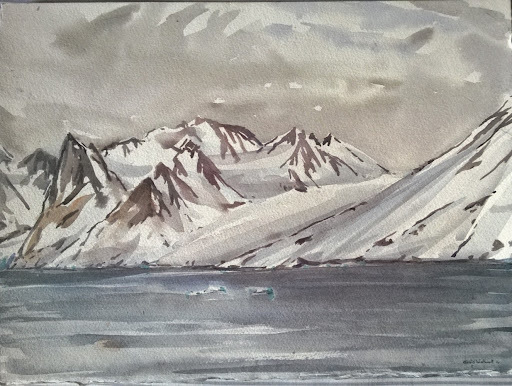 Undoubtedly Ny-Alesund was my favourite land day, our Captain Wesley Dunlop had secured a long stay at port until 11pm and with sunset not due for another month at least, I had time to explore and sketch. The painting above is of the peaks and glaciers surrounding Kongsfjorden from a beach below where the Pearl was moored with the small town of Ny-Alesund behind me. The day was still, sunny and mild and with the air incredibly clear views appeared bright and sharp. Anyone who had not seen a whale from the Saga Pearl II up to this point, had done so by the end of today because kongsfjoren was being patrolled by a single humpback whale for most of our stay. Not only could we see it as it lunge fed, surfacing with bulging pleats ahead a tell tale sequence of bubbles, but it was possible to hear the exhalation with every surface. Also audible was the loud cracking of the glacier it fed below, diving repeatedly around a large ice-flow dotted with resting terns. Eventually it entered the centre of the bay and closer to the town, which is when I drew the sequence below before it finally swam towards the open sea passing close off the Pearl's port-side to the delight of everyone on-board. At almost 79 degrees North Magdalenefjorden is our most Northerly destination after which we begin the Southward journey home. The fjord is a large horseshoe bay surrounded by formidable mountains rising steeply and immediately from the waters edge. At the Eastern, opposite end to the seaward entrance a large glacier feeds ice flows into the bay; drifting jewels of refracted blue light in a monochrome landscape. The scale of this landscape is immense, almost incomprehensible and my instinct is to put my binoculars to the mountain slopes to search for a recognisable detail that might give me better bearings. But nothing is familiar here and I am again astounded as I focus my binoculars on an apparently barren slope of ice and scree to find it teeming with life. Clouds of what seem like insects in their hundreds of thousands swarm on and off the slopes, a quick adjustment of scale and I realise I am looking at a vast breeding colony of little auk. It is possible to just make out the auks in this picture represented as tiny groups of dots. Whilst I paint the little auk colony, Paul picks out distant walrus in his scope for people to see. Just before we leave at midday I have to train my scope where he is looking, far far away I can just make out the bulk of walrus hauling themselves onto a beach, though they are hard to make out I am very pleased to be able to draw the first walrus I have ever seen. As we depart, the Pearl passes closer to the walrus and from a new angle we can just make out approximately twenty hauled out on top of one another. After this we start to pack up ready for dinner when there is a shout, someone has spotted movement in the water, we rush to starboard to see a group of walrus swimming in a porpoising fashion. They move fast in a tight group that seems to rive with blubber and tusks in a wild frenzy. What seems like panicked behaviour is in fact typical I am told and not just a reaction to the ship; travelling in tight packs in this way to me seems an effective way for the walrus to deter aquatic predators. We pass through the mouth of the fjord into a heavy sea. After an hour or two surveying in unproductive conditions of sea state 5-6 we notice a band of calm water on the horizon, we cross this visible divide and as if by some sudden enchantment the sea state instantly drops from 5 to 1 and then zero. Along this boundary we immediately pick up sightings of porpoise, minke and white beaked dolphin and then continue with more and more sightings of blows sometimes accompanied by the role of a fin whale or hump back. Amidst all this, the level of excitement is suddenly turned up when amongst a trio of blows Rachael notices something very different, I rush over from port side and get onto the blows as she confirms it, a blue whale! along with two humpback and a fin whale. The most unexpected sighting of the trip was of harp seal travelling in packs sometimes several hundred strong. The video below is of one of several of these travelling packs. Heading South again on July 1 we traversed the Western edge of the Barents Sea. For most of the day we followed a land shelf where deep water upwhelings provide conditions for nutrient rich habitats that sustain the top predators we hope to catch sight of. The water boiled with the tell tail sign of bait balls, prolonged scrutiny of which was rewarded with the sight of minke whale patrolling the corralled fish. Further out in the distance the horizon was interrupted by regular blows from the large whales feeding along the deep water drop off; fin whale 14, Sei whale 1, hump back whale 5 and other unidentified rorqual whale totalled 15. At one point a fin whale blow caught the eye at 4km or so, a flash of white that dispersed quickly, but then behind it something different, a blow that began to rise and rise until it broke above the horizon, a vertical jet of water powering straight up and reaching a height that dwarfed the others before it. The volume of water must of been immense because it kept powering upwards before a second slightly weaker but equally tall blow refreshed the drifting cloud of vapour marking the distant spot. By now some of the other observers were onto it, it had looked like a blue whale blow, we watched the approximate patch of water as we passed closer hoping to glimpse a view of the giant, but the moment slipped behind us as we steamed on ever southwards. More conclusive was the view of this fin whale which I was able to draw as it passed at one point no more than one hundred metres off our Port bow. It had been the most incredible day of surveying with little let up on sightings, many now engraved onto my memory especially that tentative glimpse of a blue whale blow erupting silently on the distant horizon. The next morning, July 2, we docked in Tromso after which our onward journey took a course through the narrow fjords before emerging into the open water of Vestfjorden, South of the Lofoten Islands. In the fjords we only sighted small Cetacean; porpoise and white beaked dolphin. Bird highlights included a very distant soaring white tailed eagle, Arctic and great skua, eider ducks and Arctic tern for whom nothing is to big to take on when protecting a nest, even our ship which they would mob without fear if it passed too close. We woke on the 3rd in Vestfjorden with conditions a perfect sea state 0-1, mist hung threaded between scattered islands and below the snow strewn massifs of the mainland. There was the faintest orange glow, suggesting a mellowing in the sunlight that until now had been relentless. The water rolled silver and smooth so it was easy to pick out the distant black shapes of long finned pilot whales. For several hours we traversed the coast and this tranquil scene remained as we picked out the forms of more pilot whale, white beaked dolphin, minke whale or porpoise silhouetted in the mirror calm. By mid morning land was out of sight and the wind strengthened as the sun rose. As the sea state deteriorated sightings became more infrequent, but there was one more surprise in store as Rachael picked up the unmistakable quiver of black dorsals on the horizon. Orca! and this time we were on a direct course to pass close to them. Everyone on the sun deck were able to hone in on the dark shapes of ten dorsal fins rising out of the water in staggered formation. As the distance between us and them closed, the white patches around the face of each Orca became obvious as they surfaced. Passing them on Starboard the biggest bull male (there was at least two in this pod) suddenly erupted into a display of breaching and tail slapping. That afternoon we hit a long distant swell pushed on by a deepening low off Iceland to the West later accompanied by heavy winds and a sea state 6 which puts an end to our day's survey. In the days that follow Saga Pearl II navigates an inshore route similar to that of the famous Hurtigruten. We find ourselves often amongst jaw dropping scenery of fjords fed by free falling waterfalls emerging from a carpet of forest at the base of dark massifs; serrated ridges, jagged peaks and snow filled cols. It is the perfect place to recover and reflect on our journey into the Arctic, although we continue to observe finding the fjords rich in life, especially recording incidental sightings of porpoise frequently. It is pleasing that after all the big and showy animals of the deep, everyone on deck is just as keen to scour the waters in the hope of glimpsing the brief splash or role of these more diminutive of cetacean. We visit Geirangerfjorden, the archetypal picture postcard scene, before heading on to arrive in Bergen. In Bergen I entertain myself drawing hooded crows, coxed down from their perches with crumbs of 'the best in Norway' Skilligsboller, a cinnamon bun I didn't think much of, but I needed to get rid of my kroner on something. The final voyage on the 6th took us back across the North sea in rough conditions producing few sightings, although that night I am happy to see darkness fall for the first time since our departure two weeks earlier. The following morning we a greeted by brilliant white cliffs on a sunny day in Dover.